A destination where tourism is not the local raison d’être, this is a place to relax unreservedly into a life by the sea. The landscape is rugged – mountains, gorges and rocky hillsides scattered with tiny villages and ancient ruins – but some of Crete’s finest beaches belong here too. Among them are spectacular Xerokambos and palm-fringed Vai, whilst Palekastro is one of Europe’s favourite windsurfing spots. And there are plenty of excellent waterfront tavernas where the passing of time is best marked by the waves rolling in nearby. To base yourself in this idyllic destination, visit our collection of handpicked villas in and around Palekastro and the far east of Crete. Off the beaten tourist track, there’s more than a touch of desert landscapes about the most easterly quarters of Crete and also an accompanying warmth and openness about the people who live there – the most hospitable hosts of an extremely welcoming island. Away from the bustle of tourist centres, the cost of living is lower and there’s an authenticity born of a community that has no vested interest in competing for tourist business – you’ll find yourself embraced within the gentle flow of daily life that carries on whether you’re there or not. But enjoys your company. Crete is divided into four prefectures and on your journey into its most easterly corners, you’ll find yourself in Lassithi. Of the four, it’s the least well known, yet there’s much to explore here, from the relics of ancient civilisations to sandy coastlines lapped by turquoise seas. Xerokambos is often described as one of the most beautiful beaches in Crete, but the former hippy hangout of Vai, surrounded by a protected palm forest comes a close second. And then there are the mountains and numerous gorges including Richtis and Kato Zakros: beautiful scars in the landscape that invite both casual wanderers and serious scramblers to admire their wildness. You won’t find grand colonnades and soaring temples, but the Minoan ruins are awe-inspiring in their antiquity. Palekastro and Itanos both offer crumbling traces and lingering artifacts – pottery, coins, statuettes – testifying to the communities that once thrived here, over 3,000 years ago, and traded successfully across the Mediterranean, Egypt and southwest Asia. However, if history’s not your thing, go for the views – and, in ancient Itanos, the rather magical experience of swimming over the ruins submerged off the beach nearby. The far east of Crete runs on intimate agricultural communities where family-run tavernas and traditional kafenions are the heart and soul of local life. While coastal villages such as Palekastro have picked up the pace a little, less than an hour inland, daily life is firmly defined by tradition – and the villages of Karydi, Sitanos and picturesque Zakros, are fine examples. However, Kato Zakros, a simple fishing village, perhaps embodies best what makes this region unforgettable. At the mouth of the Gorge of the Dead, after a beautifully dramatic drive, it rewards your spirit of adventure with beachside tavernas and its own share of Minoan heritage. Diminutive Palekastro is used to being at the centre of things. The sprawling network of ruins at nearby Roussolakkos reflects its importance as a Minoan trading centre and, after that, the Venetians built a fortress here. Now, however, the village is resting on its laurels, simply a starting point for many of the area’s most memorable experiences. And that begins with the beaches, including Blue Flag Vai and Kouremenos, a famous windsurfing hub. Hohlakies Gorge is just 5km away, offering a 90-minute walk that leads you to beautiful Karoumes Bay, or drive inland for the historic Toplou Monastery, now a place to pay homage to some excellent wines. Of all the towns and villages in East Crete, it’s the Venetian town of Sitia that has made a name for itself with foodies. Look out for the local omaties/omathies, pork stuffed with rice, liver, sultanas and spices and xygalo, a type of cream cheese. However it’s the town’s sweet tooth that wins out, specifically its unique take on sweet cakes and pastries, including a particularly light version of xerotigana, pastry spirals with honey that are also a traditional wedding dessert. Otherwise, the menus in the most easterly corners of Crete are typical of the island – a combination of simple flavours and quality, fresh ingredients with plenty of fragrant herbs, cheeses, wild greens (there are over 30 different varieties in the mountains) and, the most important ingredient of all, olive oil, often produced through local co-operatives. Greece is synonymous with raki, a strong, clear grape spirit, similar to Italian grappa and usually served with savoury snacks or dessert. Alternatively, a glass of sweet Metaxa brandy rounds off a villa supper perfectly, especially when sipped under a star-filled sky. When it comes to wine, the tasting room of the Toplou Monastery winery is a must-visit. Try their organic sweet red, great with salty cheeses and fruitcake. It was the first wine produced there and it’s still made in barrels within the monastery itself. There’s waterfront and harbourside dining in abundance throughout the region, including the excellent seafood tavernas in unspoilt Kato Zakros just metres from the pebble beach, or join the locals along Sitia’s traditional seafront promenade – also home to the popular little tavernas known as rakadika – the places to try mezedes and raki. Around Palekastro, you can breakfast heartily on Kouremenos beach with the windsurfers or, if you’re not a morning person, enjoy dinner in the village square, a buzzy local social scene. For a truly fishy treat, the Chiona Taverna near Palekastro has tables out on the rocks and a ‘no music’ policy to ensure that nothing detracts from the soothing sound of the sea. The owner, also one of our villa owners, is a spear fisherman, which makes the catch of the day a truly personal affair. You’ll find our charming Glaros Hotel in its more sheltered centre, but this 1.5km Blue Flag beach, with its stunning blue waters and laid-back beach bar/restaurant, is also famous for windsurfing. Drive north out of Palekastro and, in 2km, there’s a right turn towards the sea. On Friday and Saturday nights, the beach bar holds a family-friendly party and occasionally the tavernas host wedding parties with traditional music until 1am. This is Palekastro’s tranquil ‘south’ beach – pale sand with tavernas and some sunbeds and parasols. East of the main stretch are a number of secluded coves, perfect for a quiet swim. Chiona is 2km east of Palekastro, just south of Crete’s own ‘Table Mountain’. More sheltered from the summer north winds than nearby Kouremenos, this beach is also near the ruins of a significant Minoan settlement in Roussolakkos. As one of Crete’s most iconic beaches – and the location for the 1970s Bounty advert – Vai’s white sands, flanked by protected palm trees, can get crowded. For an all-day stay, be an early bird. The beach is a 15-minute drive north from Palekastro, and has a large car park with parking attendants in high season! You’ll find all the necessary facilities and, near the junction before the beach, there’s also a kiosk selling bananas from the local plantation, as well as other exotic fruits and natural sponges. A 2km stretch of beach, busy at the harbour end, but with plenty of space to spread out on the sand and shingle as you head away from the town. This Blue Flag beach is excellent for watersports (windsurfing in particular), and there are plenty of waterfront restaurants serving the town’s famous xerotigana (crispy pastry spirals with honey). Two coves, divided into three beaches: Itanos is home to the ancient ruins, whilst Erimoupolis, divided in two by a low, rocky peninsula, is popular with naturists who walk down to its quieter northern end. Itanos is about a 20-minute drive south of Palekastro with parking at the archaeological site. There are two paths from Itanos over the hill to Erimoupolis, one of which takes you along the cliff edge for beautiful sea views – but it’s only for the brave! A pretty, undeveloped beach with sand, small pebbles and clear crystalline waters. There’s a small seasonal taverna open at rather irregular hours, and tamarisk trees for shade. The beach is signposted off the road to Vai, approximately 1.5km along a reasonable dirt road through what is sometimes referred to the Valley of Colours. A generally quiet beach, with plenty of space to park as most people drive straight past on the way to Vai. A good snorkelling spot. A broad sweep of pebbles and dark sand, Kato Zakros has a dramatic, end-of-the-road feel, with beautifully clear water and a peaceful atmosphere. At the mouth of the Gorge of the Dead, the beach is about 8km beyond Zakros village and the drive there takes in some stunning coastal views. There are sunbeds and parasols available in the main season, and a choice of tavernas for lunch. With its amazingly clear, turquoise waters, this Caribbean-style stretch of coastline has various beaches, each with their own personality; among them Argilos with its skin-smoothing clay. The beach is a 45-minute drive along a winding road from Palekastro, just over an hour from Sitia. With their calm, shallow waters, soft sand, parasols and nearby bars and tavernas, the two organised beaches are excellent family-friendly options. You’ll have to make the 90-minute walk through the Chochlakies Gorge to get there, but this pretty beach of small pebbles and calm waters epitomises ‘the road less travelled’. Park in Chochlakies village, 40 minutes from Palekastro and pick up the walking trail that starts 1km east of the village. There are trees and some rocks for shade and 2-300m south of the main beach, there are two more small beaches to take you even further off the beaten track. Great for families, this well-organised 1km stretch of sandy coastline comes with sunbeds and parasols. Backed by hotels and apartments, there’s also a harbour area bustling with cafés and fish tavernas. The beach is about 10km from our Apothekis villas; an hour from Sitia and a 30-minute drive along the coast from Ierapetra. You’ll find plenty of parking in the village centre. For those who like to be more active, there are watersports and volleyball matches held in the calm water. With a backdrop of mountains, this picturesque sand/pebble beach is popular with the locals and has parasols and sunbeds for hire, as well as cafés and restaurants. Turn off the main road between Ierapetra and Makrigialos and make the steep descent. This beach is 13km east of Ierapetra. Parking is limited in high season. Agia Fotia means ‘holy fire’ and this beach, named after a nearby church, also has a cave which, centuries ago, was once a dwelling place. Beautiful Kouremenos beach attracts kite and windsurfers from across Europe. Lessons are available for all ages and abilities at either of the two windsurfing schools – or just enjoy the laid-back vibe at the nearby beach bar and the party on Friday or Saturday nights, for all the family. Crete’s most easterly town is authentic Greece at its most hospitable and most alive during the summer Kornaria festival, with events held at the old Venetian fortress. Soak up the atmosphere with dinner along the waterfront, where locals take their famous evening volta or stroll. Explore the tracks amongst the olive groves on a mountain bike, which you can hire on Kouremenos beach. The terrain is safe and flat and it’s almost impossible to get lost: you simply make your way down to the sea and follow the coast back home! This 15th-century, fortified monastery, a ten-minute drive from Palekastro, is one of the most significant in Crete, presiding over an estate that includes a 33-hectare vineyard. Avoid the guided tours and enjoy the fascinating museum, church, beautiful inner courtyard – and wine – at your own pace. Snorkel around the base of the ruins-topped cliff to the right of Itanos beach and, depending on the tide, you might catch a glimpse of ancient ceramics partly submerged in the sand below. These artifacts aren’t valuable, but they’re undeniably rich in history. A walk through the Gorge of the Dead will lead you to this little village. 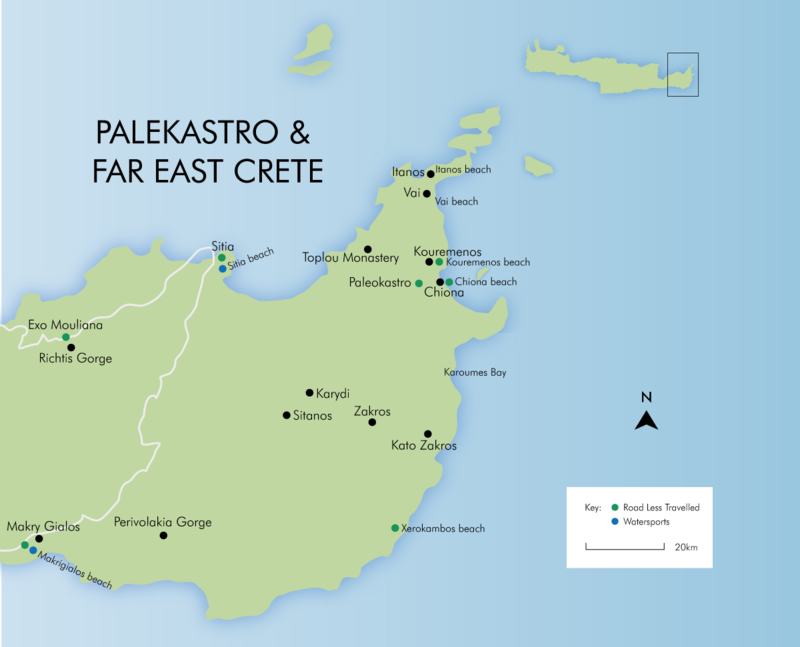 Follow the E4 European Walking Path across Crete; the same applies – and a welcome awaits you in the form of friendly tavernas, a pebbly beach and an ancient Minoan palace. Inland from Zakros, surrounded by caves and gorges, the villages of Karydi and Sitanos offer a glimpse of centuries-old Crete. Early evening, when the locals are back from the fields, is the best time to enjoy the authentic atmosphere of a traditional kafenion. For those who prefer an all-over tan, the dramatic wildness of the region’s unspoilt beaches lends itself perfectly to the shedding of swimwear. Erimoupolis, over the peninsula from Itanos beach, and the quietest stretches of Xerocambos are all popular with naturists. Unspoilt villages, scenic coastal paths, ancient ruins and breathtaking mountain trails – exploring East Crete on foot offers plenty of rewards, not least the lovely beaches you’re likely to find en route. Ask your Simpson Travel representative for some of the best walks. Feast of St George, the patron saint of shepherds and the military, is celebrated with sheep-shearing contests and feasting. Labour Day is a public holiday, celebrated with picnics and the gathering of spring flowers. Many shops close but restaurants remain open. The Medieval Festival of Sitia is a three-day cultural immersion, both traditional and contemporary, with concerts, dance performances and local arts, crafts and produce. Assumption of the Virgin Mary (Apo Kimisis tis Panagia). The biggest religious holiday after Easter is celebrated with gusto in almost every town in Greece. The annual Sultana Raisin Festival in Sitia marks the start of the grape harvest and is accompanied, of course, by wine, music and dancing. The Virgin Mary’s birthday (Genisis tis Panangias) is celebrated throughout Greece with religious services and much feasting. ‘Oxi’ Day (‘No’ Day) celebrates the Greek refusal of Italian occupation during WWII with marches, parades and much flag flying. Palekastro was named after the hill that rises on its eastern side, once the site of a Venetian fortress. Although the fort has virtually disappeared, an early morning walk to the top of that hill (half an hour each way), offers a unique perspective on the scattering of houses and glorious coastline below. West of Xerokambos, below a church, you’ll find this beautiful new-moon crescent of a bay. Break off a little of the pale clay from the low cliff that sweeps up behind the beach and, mixed with a little water, it makes a skin-softening body mask. Allow it to bake dry in the sun before washing it off in the turquoise waters. With hairpin bends and stunning bird’s-eye views of the coast, the road inland from Xerokambos is an experience in its own right – and a morning coffee in Ziros village gives you a reason to drive it. There you’ll find a number of interesting 16th-century churches and, on the way, atmospheric Chamaitoulo with its many abandoned houses. Following breakfast in Exo Mouliana, west of Sitia, your descent begins surrounded by the butterflies and wild flowers of protected parkland. Ultimately, after a 45-minute walk, you’ll reach secluded Richtis beach, but take time to enjoy the waterfall (most impressive in spring or early summer) and the small lake for a cooling dip on the way – or the way back. Although famous Vai is a magnet for beach lovers eager to experience their own ‘taste of paradise’, the tourist coaches leave at 4pm, and that’s the perfect time to arrive. Evenings are beautiful here and nights of the full moon are particularly stunning, perfect for night swimming.